If I am not reading, I usually have the radio tuned to our local public radio station for some entertainment to accompany me as I do my other work. I learned today, during my 5th grade book club, that my dedication to KUAR has kept me from the excitement of Thriller Thursday. This is a segment on a different local radio station. From the sound of it, it is both creepy and engaging. All of the kids in the group were familiar with the program. The enthusiasm they expressed as they retold the stories told me I had hit the bull's eye when I recommended we read Betty Ren Wright and her novel The Doll House Murders. This is a story with two layers. The first is a frightening tale of a family murder. The other is a touching story of how two sisters with different abilities come to know and appreciate each other. Amy has a sister with special needs. We are not told exactly what, but it is clear that she is developmentally delayed and needs a considerable amount of care to make it through the day unharmed. Amy is often given this task and is resentful and angry about her life. The mystery begins when 12 year old Amy and her mother have a fight that ends with many hurt feelings. The result of the fight is that Amy goes to spend some time with her aunt, who is living in Amy's great-grandparents' house. In the attic, Amy finds a dollhouse that is an exact replica of her new home. At first, she loves the dollhouse, until it comes to life along with the dolls that live in it. I told you it was creepy. 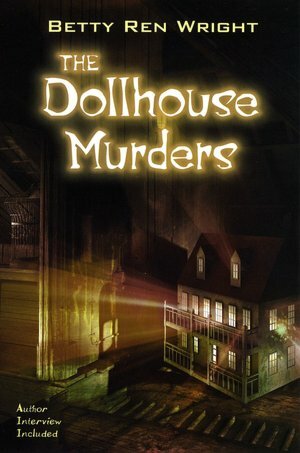 As it turns out, Amy's great-grandparents were murdered in the house and the haunted dollhouse will help solve the murder. The story will keep any readers hooked until the end. It is at the end of the story that Amy is able to successfully resolve her feelings about her family and their situation with her sister. The kids in my grouped summed it up this way, "Amy learned that fair doesn't mean equal, it means getting what you need to thrive." So they were kept on the edge of their seats, while learning a remarkable lesson. Thanks, Mrs. Wright for your worthy piece of work.